Street Drama: Snow Leopard Scouts – Lower Mustang performed the snow leopard street drama “Mountain Queen, the Snow Leopard” in Muktinath during the Yartung (horse-riding) festival (2-3 August 2012). 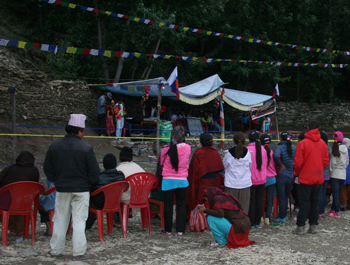 Yartung, the most locally popular annual festival in Mukinath, attracts several hundreds of people from Mustang, Manang and Dolpo districts. 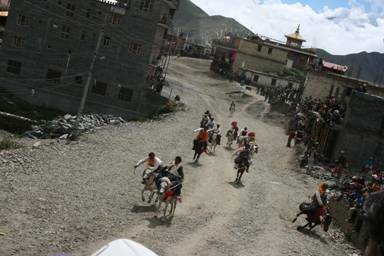 Yartung is celebrated in almost all sizable villages in these districts but the Yartung in Muktinath is special because of its strategic location – Muktinath, the holy abode for Buddhists and Hindus alike. The recently formed snow leopard scouts committee members along with other motivated students brilliantly performed the snow leopard drama. 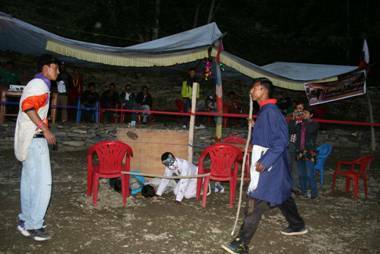 The main aim of the street theatre was send a strong snow leopard conservation message to locals, civil servants, and national and international visitors. Students also performed local cultural dances and songs. The Snow Leopard Scouts-Lower Mustang plan to publish the underlying story of the street drama in the form of a colorful comic book for a wide circulation. Interschool arts competition: The Snow Leopard Scouts – Pokhara, Kaski chapter has been registered as Snow Leopard “Open Scouts Troop” of the environmental wing under Nepal Scouts – Kaski. 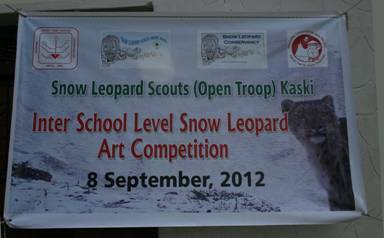 The Inter-school snow leopard art competition was held on 8 September 2012 in Nepal Scouts – Kaski office. The program was jointly organized by SLC’s Nepal program, Annapurna Conservation Area Project, and Nepal Scouts, to motivate and mobilize youths for conservation and education activities. The program was inaugurated and chaired by Sarada Prajuli, Kaski District Commissioner of Nepal Scouts. In total, 45 students and 20 teachers from 31 schools, 10 special guests from different organizations, 12 members from Nepal Scouts-Kaski, and a few reporters from local newspapers attended the program. 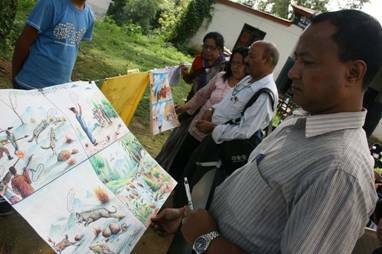 Students were instructed to draw a comic-style nature drawing depicting snow leopard and its prey. The essential element of the arts competition was that students were to include the images of snow leopard and associated species “conversing”! The best three students were awarded during the occasion. The participants watched wildlife documentaries and were given lectures on the importance of snow leopard and biodiversity conservation. Nepal Scouts hosted the program – led by the District Joint Commissioner, Dhiraj Thapa. The event was highlighted in three local newspapers (Adarsha Samaj, Himjut, Kalam and United Pokhara).